CARFAX 1-Owner, L/ Certified, LOW MILES - 41,773! Sunroof, Navigation, Heated Leather Seats, Satellite Radio, iPod/MP3 Input, Onboard Communications System, Alloy Wheels, BLIND SPOT MONITOR W/CROSS TRAFFIC AL... Back-Up Camera READ MORE! Leather Seats, Navigation, Sunroof, Heated Driver Seat, Back-Up Camera, Premium Sound System, Satellite Radio, iPod/MP3 Input, Onboard Communications System, Aluminum Wheels, Keyless Start, Dual Zone A/C, Smart Device Integration, HID headlights, Heated Seats MP3 Player, Keyless Entry, Remote Trunk Release, Child Safety Locks, Steering Wheel Controls. BLIND SPOT MONITOR W/CROSS TRAFFIC ALERT. 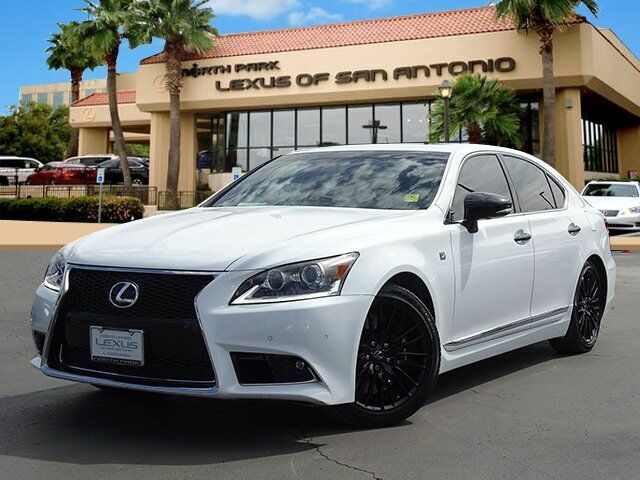 Lexus Crafted Line with ULTRA WHITE exterior and BLACK/SCARLET w/ SHIMAMOKU interior features a 8 Cylinder Engine with 386 HP at 6400 RPM*. Cross-Traffic Alert, Blind Spot Monitor, Electronic Stability Control, Brake Assist, 4-Wheel ABS, Tire Pressure Monitoring System, 4-Wheel Disc Brakes Edmunds.com explains "The 2015 Lexus LS 460 is a stunningly quiet car on the highway. Press the gas pedal to the floor and you'll find that the 4.6-liter V8 is lusciously smooth and sounds terrific. ".